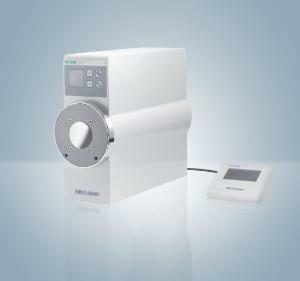 The rotarus® peristaltic pump series has a selection of different motors, varying housing safety classes and intelligent control of delivery volumes, covering a broad spectrum of application areas in the laboratory or industry. 50 and 100 W motors ensure precise delivery in speed ranges from 0,2 to 500 min⁻¹. This means that media with a high viscosity can also be accurately dispensed. Configuration data for basic parameters can also be stored in this manner and retrieved at any time. 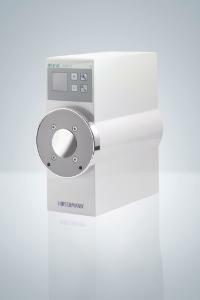 The flow and volume models have automatic blockage detection and tube rupture monitoring. 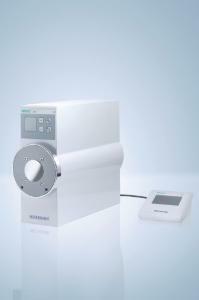 rotarus® standard: Powerful basic model with control panel on the housing. Speed can be programmed directly on the unit. 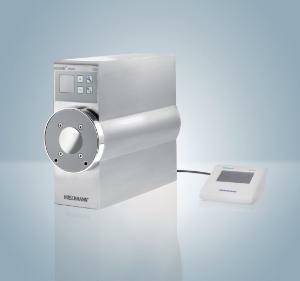 rotarus® flow: Comfortable delivery pump with control options for velocity and flow speed. 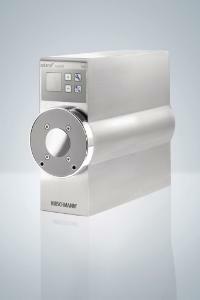 Particularly suitable for delivery tasks which require a particular delivery speed calibrated in flow rate. Control panel on the housing for basic functions (speed); external control module with TFT touchscreen for further functions (flow rate). 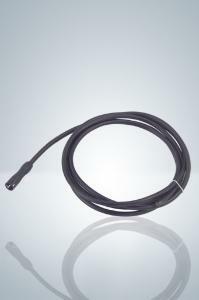 Automatic pump head and tube detection with RFID-technology. 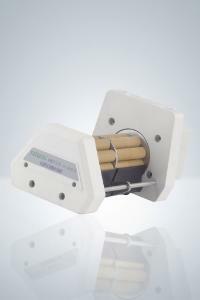 Integrated blockage detection and rupture monitoring. rotarus® volume: Extremely comfortable and accurate dispensing pump - the top model. 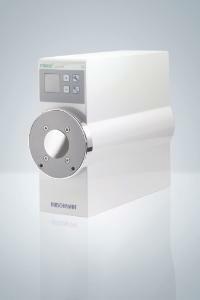 Selection options for speed, flow rate, dispensing duration, total volume and a range of other intelligent functions. Different pump methods with variable cycles and graduated speeds can also be controlled. 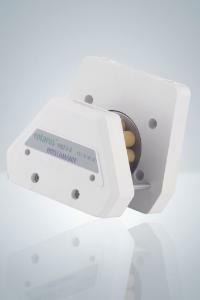 Control panel / -module, RFID-technology, blockage detection and rupture monitoring like rotarus® flow. 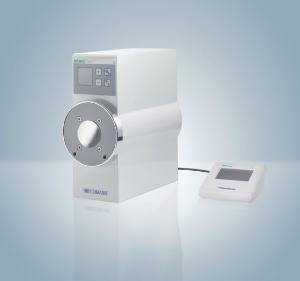 rotarus® smart: Rounds off the selection of rotarus® pump drives in the basic segment. The control panel on the housing enables simple and rapid configuration of the most important parameters, and the speed can be programmed directly on the unit. 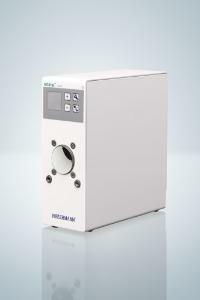 Due to its low space requirement, easily integrated in an existing laboratory environment or production system. Available with 30 or 40 W motor. 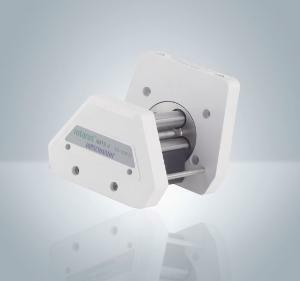 rotarus® fast: Has been specially designed for combination with piston pump heads. The homogenous geometry of the pump head adaption also enable use of all peristaltic pump heads in the rotarus® family. 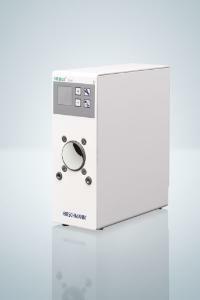 It embodies maximum intelligence and can be used either as a delivery pump, but also as a dispensing pump. As in the entire rotarus family, the parameters required for this can be programmed in an extremely clear and self-explanatory manner using a TFT touchscreen. 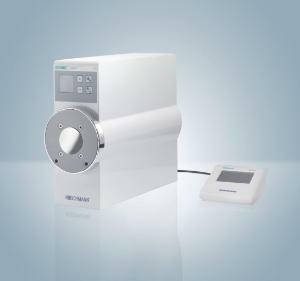 The RFID technology detects the fitted pump head, and the rotarus® fast adjusts automatically to the appropriate parameters without the intervention of the operator. This enables, for example, automatic activation of the maximum speed best suited to the pump head. The optimum pump head delivery rate is therefore exploited as a result, while wear is simultaneously reduced. Available with 80 W motor. 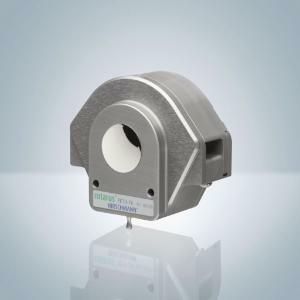 Accessories information: Pump heads and accessories: The rotarus family includes an extensive selection of single and multichannel peristaltic pump heads as well as piston pump heads. 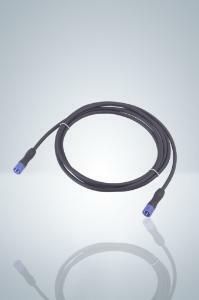 The connection technology is conceived for quick and easy handling. The pump heads can be changed with a single action, without using tools. 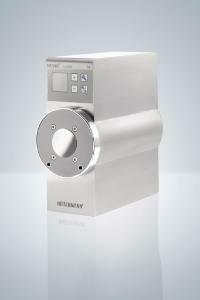 All pump heads from Hirschmann have RFID-technology for an automatic pump head detection. An ingenious accessory range ensures that you have complete freedom of action. For example, you can start dispensing with the pedal switch and have both hands free for work on the laboratory table. The pump housing can also be attached to a stand or stacked. 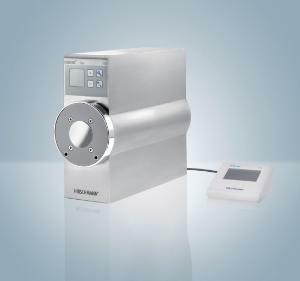 The rotarus® flow, volume and fast models are comprehensive, but can still be programmed easily via the control module. 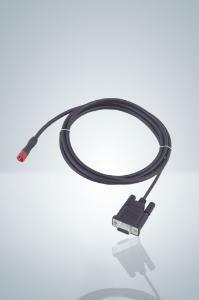 The present general terms of sale and delivery apply to all business of VWR International GmbH, i.e. particularly to industrial chemicals, reagents and diagnostic products as well as general laboratory supplies including equipment for the use of these products and consulting. By placing an order the customer irrevocably accepts the present conditions whose modification requires our written consent. If a business has been concluded on the basis of the present General Terms and Conditions of Sale and Delivery, these will apply also to further business, even if no reference is made to them. We do not recognize the general conditions of our customers, even if we do not explicitly reject them in a specific case. Our offers and list prices are subject to alteration. Orders by our customers, even when based on our offers, shall become binding only when confirmed in writing by us or when delivered. Due to rapid delivery basically no cancellation of orders is possible. If, exceptionally, the purchase order (order) is cancelled by mutual consent without stipulation of a cancellation fee, the cancellation fee to be paid by the customer amounts to 20% or EURO 36.00 as basic sum plus value added tax. This stipulation does not entitle the customer to unilateral cancellation of a contract (order). Goods without defects may be returned to VWR International GmbH only with explicit consent and carriage paid. Refrigerated goods are generally excluded from returns. We make an effort to keep the delivery deadlines defined by us, but since delivery does not only depend on us, we cannot make any binding promises. The delivery period shall be extended by force majeure or by all obstacles that by reasonable means cannot be influenced by us. Exceeded delivery deadlines shall not entitle our customers to raise damage claims, but our customers may, if the delivery deadline has been exceeded by more than four weeks and this is exclusively due to our fault, withdraw from the contract by registered mail. This withdrawal shall become effective, if we fail to make the delivery within a reasonable extension period of at least four weeks. The customer shall not be entitled to raise any further claims. The goods shall be delivered in standard commercial quality. A reasonable amount of partial deliveries is admissible. In case of purchase according to specimen or sample the characteristics of the specimen or sample are not guaranteed. Any liability for the appropriateness of the delivered goods for the purpose intended by the customer is excluded as well as for damages caused by the product or its processing. In particular also our liability for material damages according to the product liability act is excluded. Our liability for damages resulting from consulting is excluded as well. Customer complaints can generally only be considered when written orders were made. Delivery shall be made ex works, freight charges shall be borne by the purchaser. Due to increased handling expenses a lump sum for small orders amounting to EURO 15.00 will be charged for orders below EURO 150.00. If the customer has special requests concerning the type of shipment, e.g. express shipment, the additional costs shall be charged. The risk shall be transferred to the customer when the goods are transferred to a forwarder or carrier, in any case when they leave of the warehouse. The products we supply are intended for use in accordance with the documentation and manufacturer specifications under the user’s sole responsibility. Nevertheless, for some specific products (Active Pharmaceutical Ingredients), VWR, as a distributor, is not able to fulfill the requirements (European guidelines for GMP Medicinal products for human and veterinary use) and cannot sell the products. The products we supply cannot be used as active ingredients, in human or veterinary medicine. For use as pharmaceutical, cosmetic, food additives, agricultural aids, pesticides or domestic, the customer must contact the VWR local sales organisation. Our customers that intend to use these products for a pharmaceutical, cosmetic, food or any other use must carry out their own internal checks and controls to ensure that they are in compliance with their local laws,regulations (e.g. European pharmacopeia, etc.). In no event VWR International shall be liable if a customer uses a product that does not fit with the intended use. It is customer's responsibility to comply with all applicable health, safety and other regulations and to take appropriate steps in relation to the storage, handling, sale and use of the products. Instruments or other materials, that are handed over to VWR, must be decontaminated by the customer or the end-user. Decontamination is being confirmed by a decontamination declaration, that is accompanying the shipment. For damage of any kind, that is caused by missing cleaning and/or decontamination, the customer or end-user is liable in its intentity. Every owner of an instrument is obligated to forward this information in case of sale or abandonment. For return of reusable packaging point 8 is exclusively valid. Reusable packaging or containers (“reusable packaging”) remains property of the respective supplier and is only left to the customer as a loan. VWR reserves the right to demand deposit fees for reusable packaging. The amount complies with the specifications of the respective supplier. The deposit fee will be refunded completely by return of undamaged, completely deflated and carriage paid return of the reusable packaging. In case, that the reusable packaging ist not or damaged returned and/or has been diverted from its intended use by the customer, the customer expires his claim of refund of the deposit fee. Arising cleaning or disposal costs for VWR by reusable packaging, not being completely deflated or diverted from its intended use, will be at the customer´s expense. Value added tax shall be added to the prices. In case of a considerable increase of prices after conclusion of the contract we shall be entitled to raise the prices accordingly. With orders below EUR 1,000.00 we reserve ourselves the right to refrain from a separate confirmation of the order. The purchase price has to be paid without discount within 14 days after the date of the invoice. We shall, however, be entitled to make the delivery only for cash in advance or cash on delivery without having to state reasons therefor. If we accept bills of exchange or checks, we do so only on account of payment. Payment shall be considered as made only after definitive cashing of the check. Discount charges and interest shall be borne by the customer. Bank transfer charges shall be borne by the customer. If the customer is in arrears with regard to any contractual obligation towards us, all invoices shall become due immediately. In case of delayed payment interest amounting to the bank rate of interest for overdraft facility at the time, but in any case a minimum of 12% plus VAT shall be charged. Objections regarding the goods does not entitle to withhold payment. The customer shall not be entitled to any compensation for other claims. All goods delivered by us remain our property until full payment has been made. If such goods which remain our property are processed by our customer, property shall be shared in proportion to the value shares at the time of processing. Regardless of the fact whether our customer is a business man or not, the legal warranty stipulations for mutual sales transactions shall be applied. Compensation for consequential damage caused by defects in delivered goods shall be excluded. Place of fulfilment of all services is Vienna. In case of dispute arising from or in connection with our contractual relation or its cancellation the court of competent jurisdiction for Vienna 1 shall, at first instance, have exclusive competence.